Once your eHive account has been activated you can sign in and start cataloguing your collection. Click on the Create tab to begin cataloguing your collection. 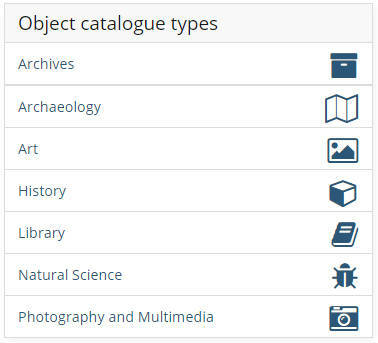 There are 7 different object record types to choose from, each tailored to a specific type of collection item. Select a record type to open a new blank record. Object records have a wide range of fields that you can use to record both descriptive and administrative information about your object. You can also upload one or more images of your object. You can create your own list of terms for use in certain fields. These ‘Pick Lists’ help to keep your data consistent and relevant to your collection. If you choose to publish your records to eHive, only the fields in the Public Fields tab of the Create screen will be visible to the general public. 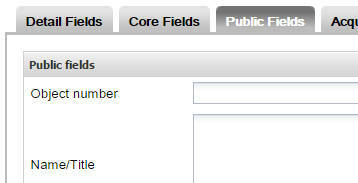 Fields that do not appear on the Public Fields tab will never be visible to the public, even in published records. These “private” fields can be used to record important information that may not be suitable for publication, such as acquisition, valuation and conservation details. When you’ve finished creating your record, click the save button located at the top and bottom of the create screen. A pop-up window will appear asking if you’d like to publish to eHive. To publish your record, tick the checkbox and click OK. Personally I consider eHive to be an absolute triumph. It is easy to use, logical, comprehensive, economic, safe (as in backed up), it has an open data/migration path to get data out and the support is superb. I will absolutely encourage other institutions I come across to change over to it. I did a pretty thorough analysis of the competition out there before selecting eHive and it seemed the best approach of all the choices.